We don’t think you need a reason to mountain bike on the Sunshine Coast. The coastal jungle and its enchanting, verdant trails have a way of creating a mountain biker’s paradise own their own. Though a little inspiration (and validation) never hurt. We’ve picked five of our favourite excuses to ride on the Sunshine Coast, knowing full well that we’re leaving many off the list. But if you want more reasons, you’ll have to come find them for yourself. Ask anyone here why they love riding on the Sunshine Coast, and the collective answer will likely praise the diversity of riding options. 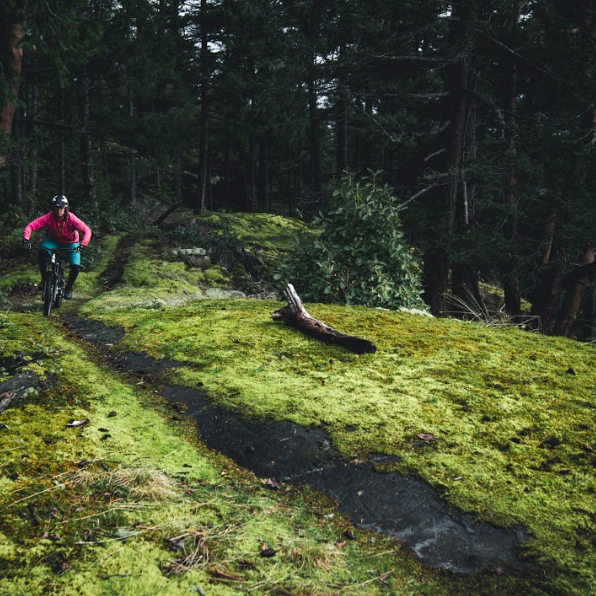 From introductory cross-country trails around Halfmoon Bay to the technical features in West Sechelt, there are so many trails for every style, level and age of rider. Some riding networks, like Roberts Creek and Sprockids, mix it all together and tease your imagination. You’ll find an equal balance of trails and features that encourage you to get out of your comfort zone or will bring you deep into the “flow zone.” Either zones are a good choice, but finding both is better. If ambition and accomplishment drive your sense of adventure, then it’s worth steering it toward bikepacking the Sunshine Coast. A hybrid of mountain biking and camping, bikepacking is a multi-day, self-supported journey (read: strap overnight gear to your bike and start pedaling) that takes you and your imagination off the beaten path for a few days. The Sunshine Coast is home to the only bikepacking route in the Lower Mainland, starting within a few minutes of the Langdale ferry terminal and ending 121 kilometres (75 miles) later at Earl’s Cove. Though it sounds committing, the Lower Sunshine Coast bikepacking route is a great introduction to this style of biking, with amenities for resupply along the way and options to cut the ride short if needed. Arguably one of North America’s most incredible mountain bike races, the BC Bike Race, July 6-13, 2018, passes through the Sunshine Coast every summer, with many racers claiming this region to be their favourite stretch of the event. 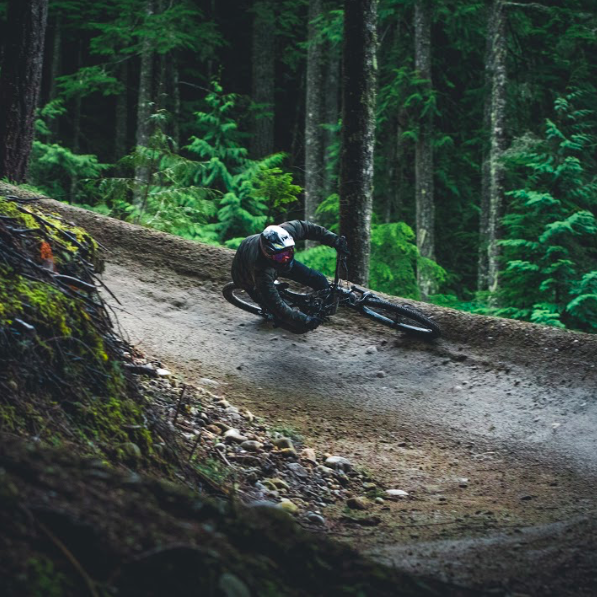 The seven-day tour de shred stage race is a spiritual and physical rite of passage that takes full advantage of British Columbia’s signature geography, singletrack and character. But you don’t have to ride at a competitive level to sample the best of BC’s trails. The 2018 race routes of Stage 3, Stage 4 and Stage 5 are mapped out, letting you wander through the ancient, mossy rainforests of the West Coast at your own pace. There comes a point on any ride where the focus shifts from what you’re doing on the trail to where you’re going afterwards. And while stellar trails are the cornerstone of a mountain bike mecca, they’re only as good as the community that sustains itself off the trail. Local businesses around the Sunshine Coast, some of which are owned by riders themselves, bring mountain bikers together when post-riding amenities shift into focus. Feed your hunger at The Gumboot, Strait Coffee or Coastal Cookery. Quench your thirst at all of the coast’s three breweries: Gibsons Tapworks, Persephone Brewing, 101 Brewhouse + Distillery and Townsite Brewing. Catch a good night’s sleep at Up the Creek Backpackers B&B or stretch out your leg cramps at Hangar Climbing Lounge. And restock on accessories at Off the Edge or Spin Cycles bike shops. You won’t encounter many people on Sunshine Coast’s singletrack in the first place, but truly having your own private trails — at least for the day — is an experience that doesn’t come around too often. 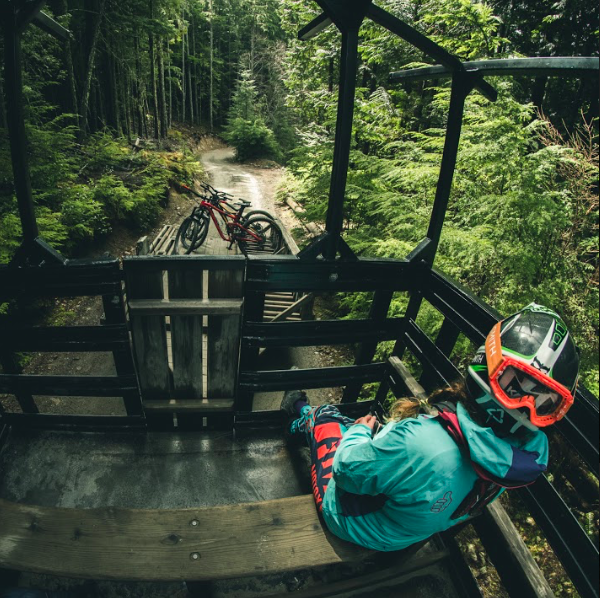 Grab a few friends, rent out the entire Coast Gravity Bike Park and get private access to all 12 downhill trails and a shuttle vehicle that’ll whisk you back to the start of each run. Even Sir Isaac Newton never came this close to owning a piece of gravity. Tell us what inspires you to bike the Sunshine Coast! Tag your discoveries on Instagram with #sunshinecoastbc and @sunshinecoastbc. Steph Nitsch is a nomadic freelance writer with no fixed address, wandering North America to find loamy dirt and champagne snow. She moonlights as the founder of Pallas Snowboards, a craft women’s snowboard company, and is an ambassador for Orbea bikes.